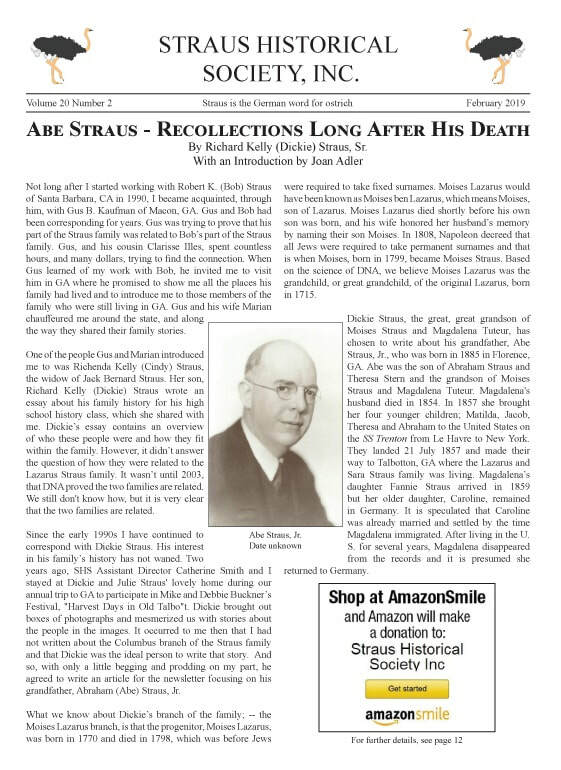 This newsletter contains a biography of Abe Straus of the Moises Lazarus branch of the family written by his grandson Dickie Straus. Also included are articles about Aunt Babette's Cook Book: 1889, the annual SHS trip to Georgia, and some interesting stories from the SHS office! Of special note is an article about the rescheduled 20th Anniversary Event, "From Macy's to Titanic - The Straus Family Legacy" to be held April 15th at The Center for Jewish History. Smaller articles include information about the upcoming 2019 Silent Auction, and updates from Friends of Straus Park.